My name is Leslie Riddle and I am the owner/operator of Back Porch Bordeaux along with my husband Jim. We also own a very successful heating and air conditioning business that keeps my husband quite busy. We have three children ages 18, 16 and 10. Our children are very hands on with our dogues and especially when we have puppies. We spend a great deal of time outside around our pool area and on our back porch and our dogues are always there with us. They enjoy laying on the cool concrete under the outdoor fans and that is where the name Back Porch Bordeaux originated from. At Back Porch Bordeaux we are small hobby breeders who only have a few litters per year. Our Dogues are in our home with us and are part of the family. 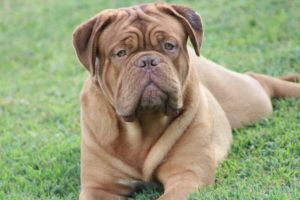 We also participate in AKC conformation shows when time allows. Our puppies are whelped in our home as well and receive constant love and attention in order to promote great socialization and good temperament. Our Dogues are health tested prior to breeding and our puppies are AKC registered, champion sired and have champion bloodlines. We breed for health, conformation and temperament. Our puppies are vet checked and micro-chipped and also come with a written contract, one year health guarantee, lifetime breeder support and a lifetime return policy. Our puppies are only available to approved homes who will treat them like family members and our buyers are always welcome to visit our home and dogues.